It’s been a number of years since I last visited this place. From what I remembered, service was spotty at best here and my visit in late February confirmed that things haven’t really changed much over the years. To be fair, service appeared a bit friendlier for regular patrons and it depended on who was serving you. The interior is laid out in a utilitarian manner with a combination of tables and booths set up in a grid pattern that takes up the entire room. Off the entrance is a small cashier area where you go to pay (cash or debit only). The restaurant filled up by noon so it’s still popular with many people. 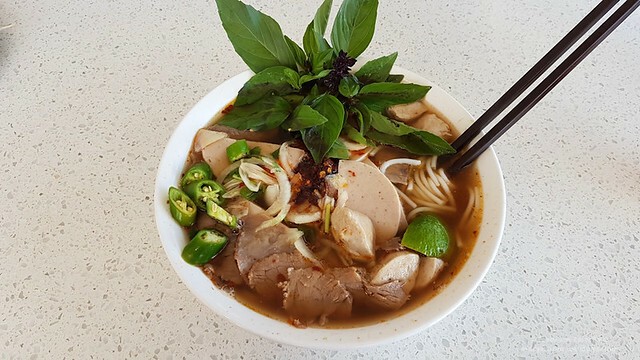 On my first revisit, I ordered the Bun Bo Hue ($9 for large) which contained beef, Vietnamese ham, and chicken balls. There was plenty of thinly cut beef (which wasn’t too tender) as well as tender, thick, round rice vermicelli noodles. 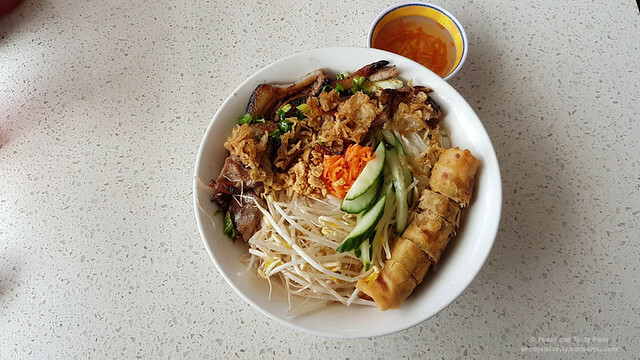 On a subsequent revisit, I ordered the Bun Thit Nuong, Cha Gio ($11.95). 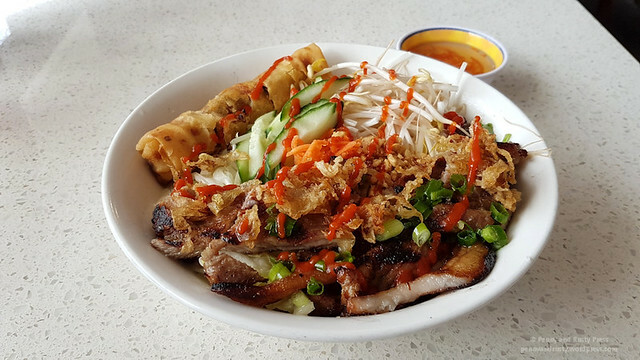 This is a popular dish consisting of grilled lemongrass pork with rice vermicelli and deep-fried spring roll. I had a different waitress on this visit and service was a bit better. This was a very large bowl and was quite filling. They don’t use rice paper wrapper in their spring rolls (which was a bit of a disappointment to me) but it wasn’t too bad and was freshly fried with a tightly packed filling. I found that the grilled pork, which had some fatty bits in it, was just okay and had a bit of char to some of the pieces. The fish sauce lacks flavour but this is a filling dish if you’re looking for something to satisfy your hunger. 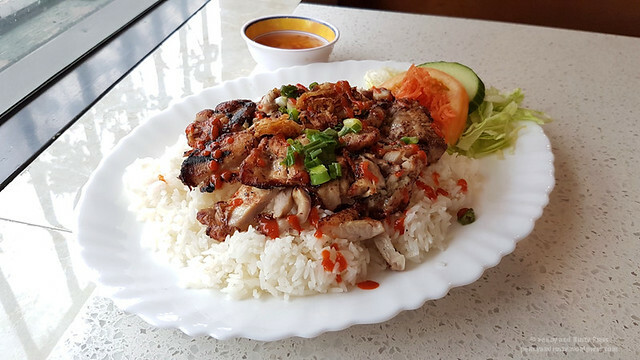 On my subsequent revisit, I ordered the Lemongrass Chicken with Rice ($10.50) which turned out better than the lemongrass pork. Too bad it didn’t come with a spring roll. The chicken had a nice char on it but the meat tended to be on the dry side. Don’t even bother with the tomato because that really wasn’t very good. Like all of my other meals here, the portion size is very generous. 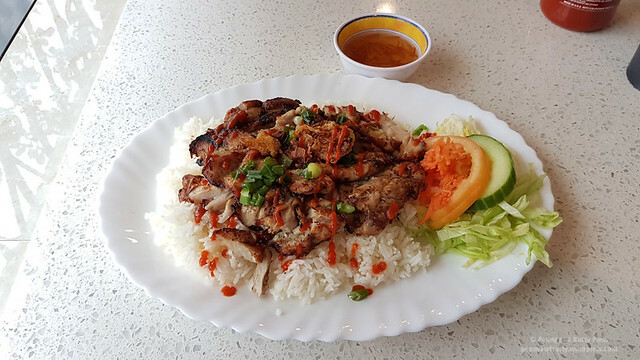 Overall, the food here is fairly average in terms of Vietnamese food with more focus put on giving you large serving sizes instead of flavour. The soup noodles come out very quick but the grilled items take a bit longer to come out. 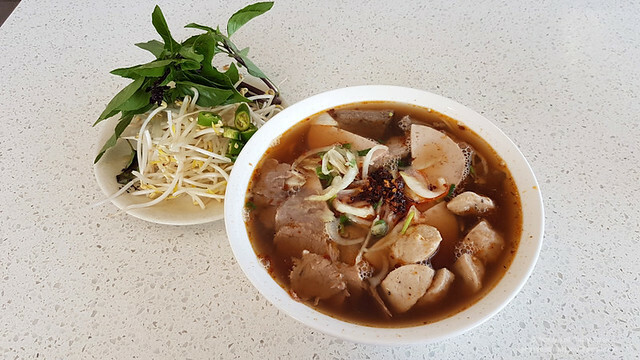 Posted on August 1, 2018, in Restaurant Review, Vietnamese and tagged Bun Bo Hue, Bun Thit Nuong, Burnaby, Food, Grilled Lemongrass Pork, Lemongrass Chicken, restaurant review, Vietnamese. Bookmark the permalink. Leave a comment.